After you save a recipe, you will be redirected to the list view. The list may show few recipes with an orange border. This is done to highlight incompleteness of the recipe in one form or the other. Some of the common reasons and ways to correct them are detailed below. Unable to see ingredient price in recipe list? There are 3 main reasons why ingredient price does not reflect. 1. Item is not procured in that outlet. In the example below, "Red Capsicum" was added as an ingredient in the recipe but never procured. So it&apos;s cost cannot be derived. System provides flexibility to add ingredients that are not purchased. This is to ensure chef or cost controller can proceed with recipe definitions without being blocked. Typically, such issues are handled by adding back dated sample purchase entry for such items with approximate cost. You can block users from creating new ingredients from Settings->Validation Configuration. Unselect the box "Allow user to add new SKU/unit". If you purchase a SKU in non standard units such as "cases", "boxes", "pkt" and use in standard metric units such as "kg, "litre", you need to provide a conversion for that SKU from Settings->Conversions page. We added a purchase for "Red Capsicum" in "kg" but still price is not shown, though "kg" to "g" conversion is standard. 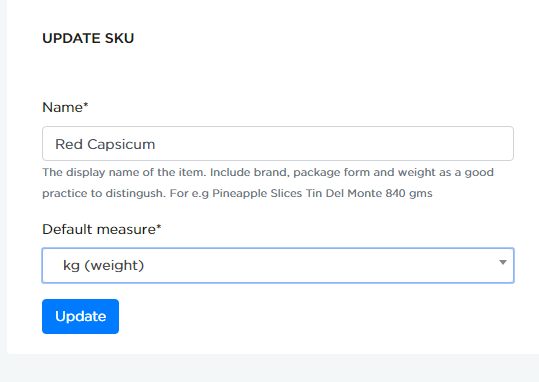 Go to SKU List and check the default unit of "Red Capsicum". Here the default unit is set as "tin", whereas we use it in &apos;g&apos; and &apos;kg&apos; in other places. Change to your preferred default unit i.e. kg in this case. Set your preferred default unit for the SKU if the default choice is not appropriate. Unit field for any selected SKU in purchase, indent or stock transfer will be filled with the default unit. Typically a recipe should be linked to a menu item or it is part of another recipe (as a sub-recipe), which is why you are probably adding it in the first place. If this is not done, you will find the orange border, indicating incompleteness. 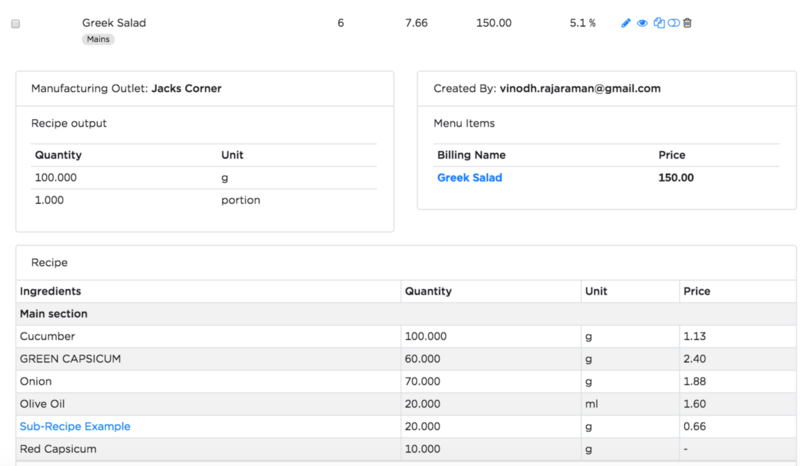 Note: The system automatically identifies a recipe as a sub-recipe once it is added to a recipe.